Americans as a whole view themselves as reasonably prudent and sober people when it comes to matters of money, reflecting the puritan roots of the earliest European settlers. Yet as a community, we also seem to believe that we are entitled to a lifestyle that is well-beyond our current income, a tendency that goes back to the earliest days of the United States and particularly to get rich quick experiences ranging from the Gold Rush of the 1840s to the real estate bubble of the early 21st Century. 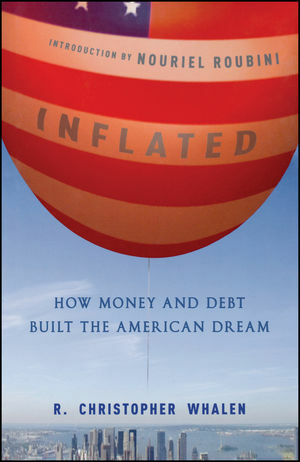 Inflated examines this apparent conflict and makes the argument that such a world view is so ingrained in us that to expect the United States to live in a "deflated" world is simply unrealistic. It skillfully seeks to tell the story of, money inflation and public debt as enduring (and perhaps endearing) features of American life, rather than something we can one day overcome as our policy makers constantly promise. Features interviews with today's top financial industry leaders and insiders. The gradual result of the situation we find ourselves in will inevitably lead to inflation, loss of economic opportunity, and a decline in the value of the dollar. This book will show you why, and reveal how we might be able to deal with it. R. CHRISTOPHER WHALEN is cofounder and Managing Director of Institutional Risk Analytics, a Torrance, California, bank rating agency and consulting firm. He is editor of IRA's popular newsletter, the Institutional Risk Analyst, and heads IRA's advisory practice. Whalen is among one of the most frequently quoted financial analysts in the United States and appears regularly on Bloomberg, CNBC, and National Public Radio. He worked for the U.S. House of Representatives, the Federal Reserve Bank of New York, as a Mexico analyst during the 1990s, and as an investment banker for firms such as Bear Stearns & Co., and Prudential Securities. During his three decades as an investment banker and writer, Whalen contributed to publications such as Barron's, American Banker, the New York Times, Financial Times, and many others. He has testified before both the U.S. Congress and the Securities and Exchange Commission on issues ranging from financial regulation to OTC derivatives to XBRL to the federal rescue of GMAC. For more information, visit www.rcwhalen.com. Chapter 1 Free Banking and Private Money. The Bank of the United States. The Age of Andrew Jackson. The Rise of Bank Clearinghouses. Chapter 2 Lincoln Saves a Nation by Printing Money. Salmon Chase and Jay Cooke. Fisk and Gould Profi t by Infl ation. The Battle Over Silver Money. Chapter 3 Robber Barons and the Gilded Age. Chapter 4 The Rise of the Central Bank. The Passage of the Federal Reserve Act. Roosevelt, Wilson, and the Politics of Reform. Chapter 5 War, Boom, and Bust. A Return to Republican Normalcy. A New Era of Debt and Investing. The Rise of Consumer Finance. Bust: Stocks Fall and Tariffs Rise. Ford, Couzens, and the Detroit Banks. Chapter 6 New Deal to Cold War. FDR and the Era of Broken Precedent. The Seizure of Gold and Dollar Devaluation. Dollar Devaluation Hurt World Trade. The Rise of the Corporate State. Central Planning Arrives in Washington. FDR Embraces Federal Deposit Insurance. The Fed and the RFC. Corporativist Reform at the Fed. Wartime Inflation and Debt Finance. Bretton Woods and Global Infl ation. Chapter 7 Debt and Infl ation: A Rising Tide Lifts All Boats. The End of the Dollar Peg. The Return of Sovereign Borrowing. Chapter 8 Leveraging the American Dream. Chapter 9 A New Monetary Order. Triffin's Dilemma and the Dollar.